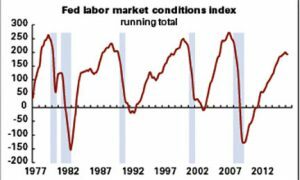 Recently we’ve been writing about the three-consecutive-month decline in the Fed’s Labor Market Conditions Index (LMCI), which is updated on the Monday after the employment report. The sluggish April report caused the LMCI to decline further, making it a four-month streak. The decline may not look like much on the graph on p. 7, but four-month running declines are rare outside recessions or the months immediately preceding them. There were such streaks during the “mid-cycle slowdowns” of 1985–1986 and 1995–1996, but those followed periods of Federal Reserve tightening. Otherwise, none. We suppose you could call the end of QE and the upward nudge in fed funds a tightening, but the central bank remains extraordinarily indulgent with little immediate prospect of a hostile turn. So count us slightly more troubled than we were the time time we wrote about this.